Ouija Board was last night rewarded for regaining her Breeders' Cup crown in 2006 by being named ROA/Racing Post 'Horse of the Year'. And the celebrations were complete when the five-year-old's owner Lord Derby was named 'Owner of the Year' by the members of the Racehorse Owners Association. The globetrotting mare's season had begun at Nad Al Sheba, and in June she secured her first Royal Ascot triumph in the Prince of Wales's Stakes. 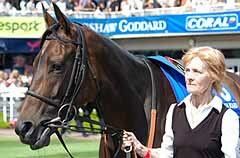 A 'Glorious Goodwood' winner in August, she went on to score at Churchill Downs last month. 2006 was the fifth year in which Racing Post readers - in addition to the ROA's 7,200-strong membership - cast votes for the 'Horse of the Year' award at the ROA's 25th Annual Awards Dinner & Dance. Cheltenham Gold Cup winner War Of Attrition was selected as the 'Outstanding Chaser', and Champion Hurdler Brave Inca took the 'Outstanding Hurdler' crown. The 'Outstanding Three-Year-Old Colt' was Derby winner Sir Percy, and the 'Outstanding Three-Year-Old Filly' was Oaks and Irish Oaks heroine Alexandrova. Among the two-year-olds, Teofilo was chosen as the top colt, and the filly's prize went to Sander Camillo. For his winning exploits on all-weather tracks and at Ascot where he climaxed a superb season by claiming the Cumberland Lodge Stakes, Young Mick took two awards - 'Outstanding Handicapper' and 'All-weather Horse of the Year'. 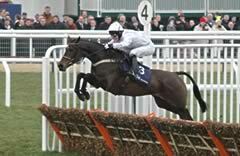 In the novice National Hunt awards, Black Jack Ketchum took the hurdling honours and this season's King George VI Chase prospect Monet's Garden won the chasing category. Katarino retained the 'Outstanding Hunter Chaser' award. ROA members voted Newbury as the 'Most Owner-Friendly Racecourse of the Year' for the third successive year.